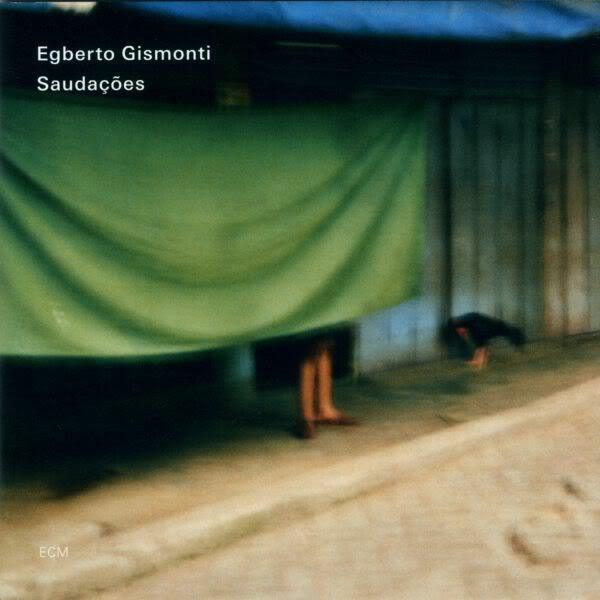 Saudações, of which the title means “salutations,” marks the welcome end of a 12-year ECM hiatus for Egberto Gismonti since 1997’s Meeting Point. Whereas on that record he explored his conservatory training in a set of lively orchestral compositions with Gismonti as piano soloist, the first of this two-disc follow-up consists of Sertões Veredas, a suite in seven parts for strings alone, while the second disc features guitar duets and solos with the composer’s son Alexandre. Seasoned Gismonti listeners will know what to expect from the program’s latter half. In addition to renditions of classic tunes, including “Lundú,” “Dança Dos Escravos,” and “Zig Zag”—each a bouquet of nimble, sparkling exposition—the duo soars through a veritable résumé of Father Gismonti’s uniquely tender ferocity. From subdued (“Mestiço & Caboclo”) to slipstream (“Dois Violões”), the performances emit a veritable brocade of fire. Alexandre contributes two solos to the program: the gentle, cyclical “Palhaço” (by Egberto) and the original “Chora Antônio.” Alexandre’s animations make them both album must-hears. After a few jagged turns, notably in “Dança,” Egberto ends by his lonesome with the title track, an adroit little bee of a tune that settles in a flower of harmonics. Gismonti & Son play with freedom of detail, all the while holding fast to an underlying pulse that distinguishes so much of Egberto’s writing. Concentrated as they are, any one of these pieces might expand to an album’s length without loss of potency. In a sense, this is the feeling behind the orchestral suite that begins the album. As always, Gismonti paints a world proper, a landscape of vivid memories, childhood impressions, and mature reflections—all tied together by a love for his homeland and its peoples. Subtitled as a “Tribute to Miscegenation” (Tributo à miscigenação) and played with vivaciousness by Cuba’s Camerata Romeu, it is a heartfelt tribute to—and preservation of—times and places clearly dear to him, all intermingling in a new continent. The cornucopia of influences from which he has drawn is already apparent in the first movement, of which the spirit remains very much rooted in the composer’s guitaristic panache (even his pianism, heard elsewhere, turns the keyboard into an enormous, fretted instrument). More than the instrument’s mechanics, its immediate tactility carries over into the scores, which sound like magnified string quartets. Gismonti’s attention to the orchestra’s lower end is especially robust, the double basses providing pulse, melodic undertow, and soil for botanical riches above ground. The occasional cello line acts as a link between dynamic extremes, leaving the violins to pollinate, as they will. Each movement is a suite of its own, moving from high to low, slow to fast, loud to soft in a heartbeat. The most obvious references are to Stravinsky (Part IV), John Adams’s Shaker Loops (Part V), and even the romantic touch of a Mendelssohn (Part VI), leaving the final part, an ode to folk traditions and dances, to bask in the resolution of camaraderie. Speaking of attention, Saudações is recorded with just the right balance of intimacy and mountainous space. Peak slope into a valley of riches, each more scintillating than the last. A treasure trove for Gismonti fans. Even more so for newcomers. Either way: leave your shoes at the perimeter and step into the circle as you are.